There’s more to professional success than earning a degree, acquiring product knowledge and wearing appropriate attire to the office. The do’s and don’ts of greetings and introductions, business conversation, mixing and mingling, business etiquette in correspondence, telephone courtesy, etc. play a vital role in how you are perceived by others. 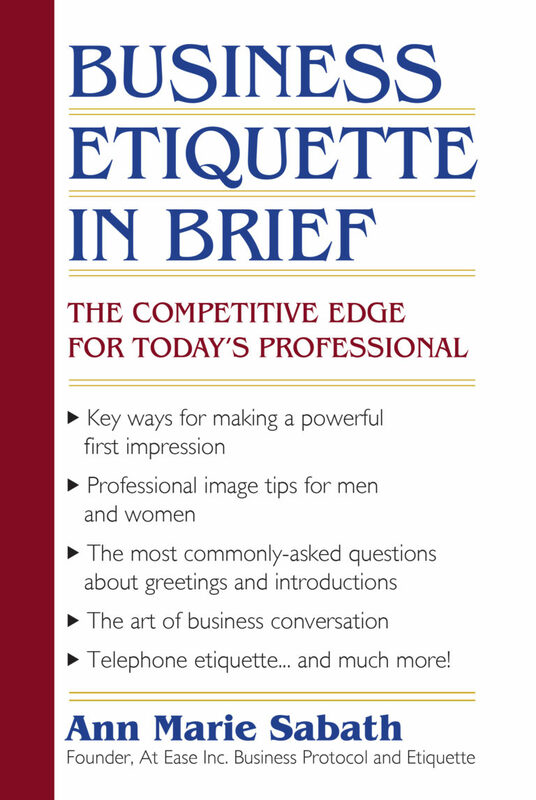 BUSINESS ETIQUETTE IN BRIEF is a must for anyone who wants to gain the competitive edge and climb that slippery ladder of success in style! How to start and sustain a conversation. Have you ever been obliged to attend a function at which you knew no one? As you approached people or as they approached you, what did you talk about? Believe it or not, it’s quite easy to start and sustain a conversation. The key is to listen more than you speak. Just as important as knowing what to ask is recognizing how to phrase questions. A sure way to get others to respond is to ask open-ended questions. If, for example, you’ve just met someone, don’t ask, “Are you one of Bill Jones’ customers?” This is a dead-end question likely to get you little more than a “yes” or a “no” in response. Instead, use an interrogative – Who? What? When” Where? Why? How? For example, “How do you know Bill Jones?” This kind of question should get you a respond with some detail, thus opening the door to more conversation. While it’s important to phrase and position your questions carefully, it’s also crucial that you appear to be sincerely interested in what you are asking the person and in the response elicited. Rather than trying to bluff your way through, work on developing a sincere interest in others. Everyone knows you can spot a phony a mile away.